Our entire country continues to follow the horrifying events in Annapolis last week when an active shooter changed the lives of everyone in the Capital Gazette building . What’s being labeled as a targeted attack tragically ended in the death of five journalists working at the local newspaper when a shooter entered the building armed with a shotgun and smoke grenades. 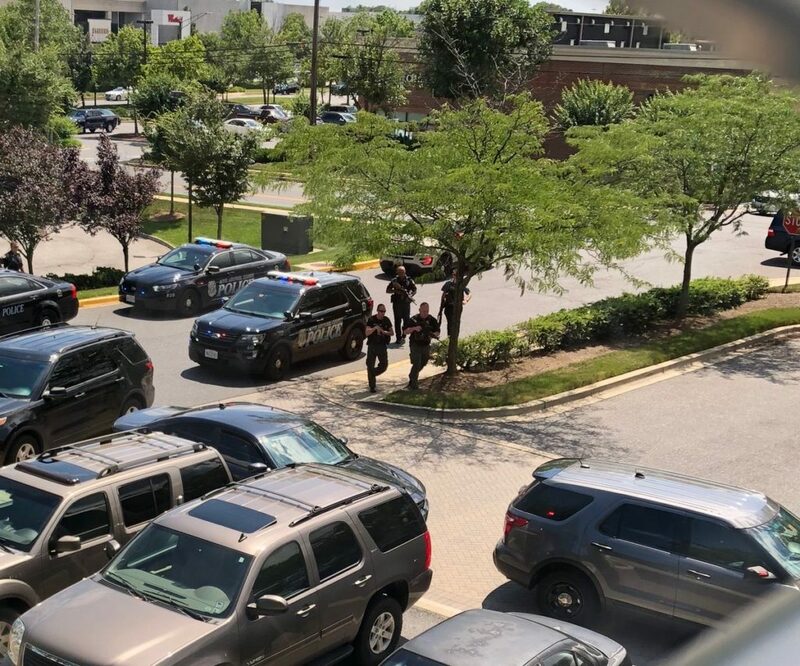 The suspect who was taken into custody after the devastating incident had filed a defamation lawsuit against the Capital Gazette back in 2012, allegedly, leading to the murder of the innocent journalists. Edgewater Technology Inc (MA): In December 2000, an employee at a Massachusetts internet consulting firm, Edgewater Technology Inc., killed seven of his coworkers before apprehended by police. Reports state the shooter was supposed to have his wages garnished after the holidays because of delinquent tax payments, which was believed to be the motive behind the attack. Hartford Beer Distributor (CT): After a driver at the Hartford Beer Distributor in Connecticut was caught stealing, he resigned from his position only to return on a shooting spree. The shooter killed eight people and injured two before killing himself after the rampage. Accent Signage Systems (MN): When an employee was fired from his job back in September 2012 at Accent Signage Systems and no one could have predicted what happened next. The employee returned with a 9mm Glock, killing the two managers who let him go along with five other employees. The shooter turned the gun on himself before he could be taken by police. Violent attacks in the workplace, particularly those with the use of deadly firearms, are becoming more frequent than ever before- some are spontaneous, some planned, and others are conducted completely at random. It’s inconceivable to think that a worker in any industry should have to fear their coworkers or any other individual while on the job, yet these tragedies continue to occur, taking the lives of more innocent American workers every year. Homicide is currently the fourth-leading cause of fatal occupational injuries in the United States, according to the Occupational Safety and Health Administration (OSHA). Though the media may only show us the worst outcomes of workplace violence, there are several other methods employees may use prior to gun violence that could affect the culture and safety of the workplace. Violence by Personal Relations: Individual who has some sort of personal relationship with an employee or employer outside of the work environment. According to a report released by the Bureau of Labor Statistics, around 500 workers were victims of homicide while on the job in 2016 and 16,890 others suffered from non-fatal injuries due to homicidal attempts. Nearly 2 million American workers have formally reported to OSHA that they have been a victim of workplace violence- a statistic that is also severely underreported. Workplace violence can get out of control quickly. However, it doesn’t happen overnight. Knowing what to look for when it comes to signs of workplace violence and the threat of a shooting attack at your workplace is a skill that all employers and employees should be trained on to help keep everyone safe on the job. In the aftermath of a terrifying act of workplace violence such as a shooting, it’s not uncommon to hear from coworkers that maybe they weren’t completely surprised. Pinpointing when and where workplace violence is going take place may be impossible, but looking for the warning signs that an employee may act out violently could save your life and the lives of others around you. Alone, these risk factors may not lead to any violent tendencies, but the APA research shows a combination of these risk factors may highlight individuals more at risk for violent behavior. These warning signs are not the only indicators that someone will commit a horrifying crime, but they should always be monitored and reported to the proper work officials just in case. It’s a common misconception that only people with mental illnesses commit unspeakable crimes such as mass shootings. Research performed by the APA shows that less than 1% of mass shootings are carried out by people with serious mental illness, along with only 3% of overall violent crime. Gun restriction laws tend to focus on keeping firearms away from the mentally ill; however, with little research to link gun violence to mental illness, employers are safer to use the warning signs above as a prediction of violent behavior than focusing on employees with a history of mental illness. Workplace tragedies may not come with obvious warning signs, but there are steps employers and companies can take to prepare employees for threats of violence and help them take action to protect themselves if an attack occurs. Identify tools you might use to secure your workplace. Create a facility map that marks all doors, security cameras, and stairwells. Devise a plan for access control. Ensure security cameras are positioned where you need them. Consider hiring security guards. Many facilities contract with security companies to provide guards. Address how to secure particularly vulnerable areas. Conduct a periodic review of security measures. Devise a plan for communicating with employees in the event of a security emergency. Create a system for tracking security issues. Designate a spokesperson to issue communications in the event of an incident. OSHA: Offers online presentations, reference materials, training resources and online prevention programs for employers. National Safety Council: Offers training, emergency action plan help, training exercises and information creating an action plan. If you need additional help in knowing where to start, there are numerous workplace violence consulting firms that can assist your company in identifying warning signs, safety hazards, and creating a plan to react to violence on the job. Maintaining a system for complaints and concerns and allow them to be express in non-judgmental forum. No American should have to fear their place of employment. Violence in the workplace of any kind is completely unnecessary and all employers need to be prepared to protect their employees from violent threats and attacks. If you or a loved one have been a victim of workplace violence, D’Amore Law is here to fight for you. Our winning team will fight for your right to safety at work and provide a free case evaluation to explore all your options in seeking justice for your injuries.